Recently few of my friends bought thumb drives for torrent (bit torrent) activities. Some torrent software has some thing like advanced disk caching feature but still, to my opinion, it is better to rest the hard disk from the torrent activities. More importantly, it may not be the money matters but the value of other personal data that you keep in the same hard disk. With USB thumb drives advancing from 4 to 8GB, now widely available 16GB and a little premium to pay for 32GB, I suggested why not just get a few thumb drives and plug them to the USB ports and save the torrent downloads to the drive? That definitely offloads the hard disk while offers portability to share the downloads easily plus you may pass on the download activities to other helpers if you need to shut down your PC for few days. And if the drive is damaged, you only lose the particular download. No big deal and just need to re-download. Sound cool huh? The idea was taken. A bugger even went to the extent to get a powered USB port replicator for more torrent activities! *_*|| memang kiasu! However, we immediately encountered a show stopper. 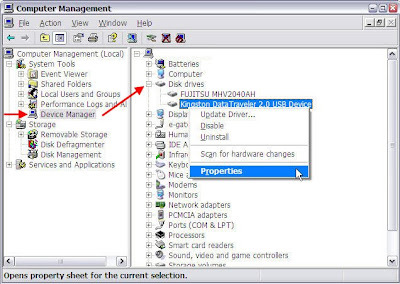 Most thumb drives come in FAT32 file system for widest compatibility with various operating systems, Windows, Mac etc and fit for general use by most users. A piece of technical info you need know, that FAT32 can only support a maximum file size of 4GB in a single file. Meaning, if you have a file with size more than 4GB, with a FAT32 formatted drive, be it thumb drive or hard disk, you will not be able to copy/create/move the file to the drive. And because of this technical limitation, we couldn't download compressed 720p or 1080p HD files, which are no doubt more than 4GB per file, to the drive without reformatting the drive to NTFS file system. It reads "NTFS is not supported on this device optimized for removal. To change the way this device is optimized, select the Properties tab in the device's property sheet." This was the first time they hit by this error and me too, it's my first time to see this message. I've formatted so many thumb drives, converting from FAT or FAT32 to NTFS with no error at all. I suspect that the manufacturers changed their design which caused error in formatting new batch of drives with higher capacity. I read through the error message and roughly had the idea where to start my troubleshooting. Oh, make sure you have your thumb drive plugged in and you have administrator privilege on the computer. Some terms similar to the error. The default setting was "Optimized For Removal". I chose the other option, "Optimized For Performance" and clicked OK. I then retried to format. And bingo! No more error after the first attempt on troubleshooting!!! I changed back to "Optimize for removal" after format and tested lightly few times to remove the drive without legally using the Safely Remove Device option, the files are still intact, no corruption at all. But it may need thorough test before conclusion. 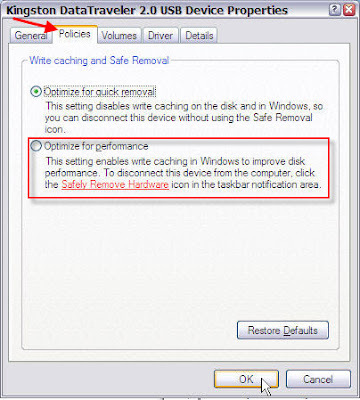 Safest is to remove the device properly with Safely Remove Device option, better safe than sorry. Anyway, this isn't an issue to us 'cause we will not be removing the drive so often, it's stuck like an ice cream stick at the PC most of the times to perform its duty.